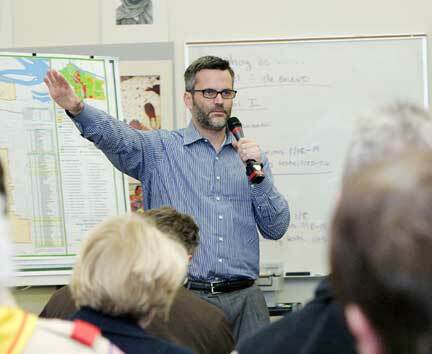 Saying he wanted to hear directly from outer East Portland citizens, Portland City Commissioner Sam Adams lets folks at the Parkrose forum speak their minds about roads, sewers, and the arts. Most Portlanders complain that their government officials only listen to them after key decisions ‚Äì like budgeting ‚Äì have been made. Not so with Portland City Commissioner Sam Adams. 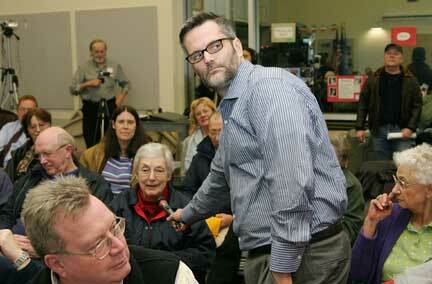 Folks from all over outer East Portland–about 60 in all–filled the Parkrose High School Community Room on January 4. Attendees identified themselves as being from the Parkrose, Argay, Hazelwood, Wilkes Community Group, Pleasant Valley, Lents, and Russell neighborhoods. 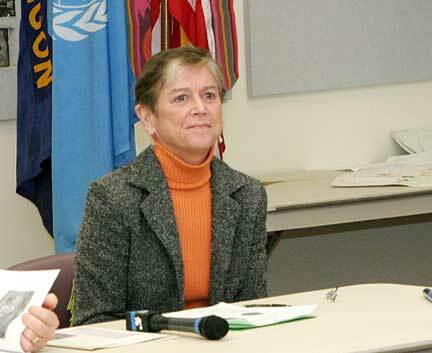 Before the road, sewer and arts bureau chiefs made their presentation; Adams called for questions related to their services. 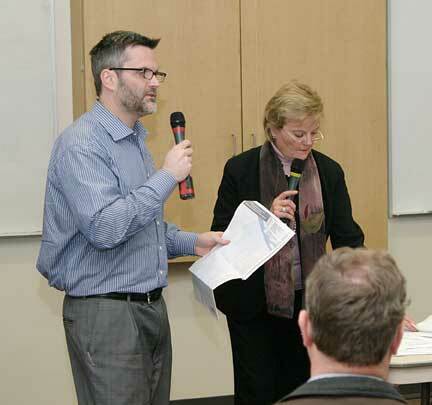 After questions regarding transportation issues were recorded, Sue Keil, Director of Portland Office of Transportation, (PDOT) began her presentation. She detailed sources of the bureau’s revenues ‚Äì gas taxes and parking meter revenue. Then, Keil outlined projects being looked at for outer East Portland. Sam Adams and PDOT’s Sue Keil take questions before talking about specific highway safety projects being considered for outer East Portland. “Some of the most dangerous intersections are out here,” Keil told the audience. She said, statistically, the most deadly are at SE 96th Ave. at Foster Rd., SE Stark St. at 102nd Ave. and NE Glisan at the I-205 interchange. “We’re considering installing ‘red-light cameras’. They don’t typically reduce the number of accidents. But they reduce the severity; especially for pedestrians,” Keil explained. In all, PDOT plans to spend $250,000 to improve six outer East Portland intersections and roads. 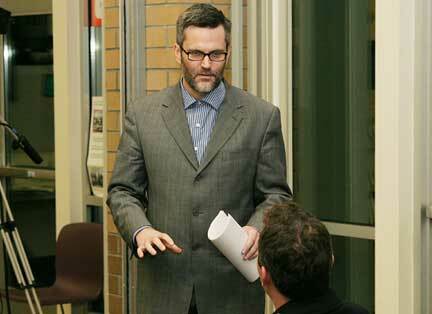 Portland Bureau of Environmental Services manager Dean Marriott explains his agency’s budget. Many questions posed regarded why outer East Portland residents were forced to pay “storm water remediation” charges when their rainwater runoff never enters the sewer system. “We paid to have our sewers installed; why don’t people in old Portland have to pay to fix theirs?” a neighbor asked. Adams went on to explain that there are 9,000 rainwater injection systems, known as “sumps”, all across the city. He added that federal regulators are concerned that the city sumps aren’t protecting groundwater from polluted rain runoff. The bottom line is, Adams stated, that if all of outer East Portland’s sumps have to be retrofitted to meet federal government standards the cost will be borne by all residents across the city. Adams listens to a forum participant as he expresses his concern about sewer costs in outer East Portland. Marriott said East Portland initiatives to be funded include protecting wellheads, installing “green streets” program as streets are improved, sewer improvements along SE 92nd Ave. and Powell Blvd., the Lents sewer extension, and an extensive project along Johnson Creek. Regional Arts & Culture Council executive director Eloise Damrosch listens to a neighbor’s concern about arts spending in East Portland. Damrosch explained how the RACC advocates for state and federal funding, distributes information about project, art jobs and programs, and gives out grants for art projects. 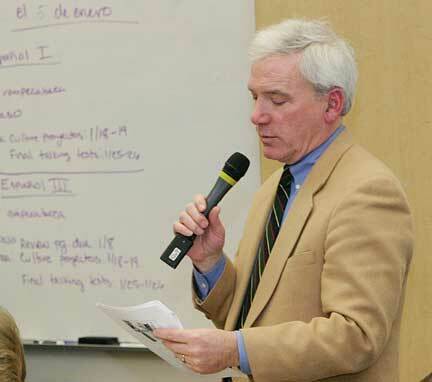 A handout provided by Damrosch detailed sixteen grants for East Portland projects. Sadly, listings for “Public Art in East Portland” detailed only five projects, some of them more than a decade old. After letting the commissioner and his staff have a few days to digest the information gleaned from Parkrose forum, we contacted Adams to find what he, and his bureau directors, learned. Asked his thoughts regarding BES, Adams told us, “The city has a lot of work to do to repair the hurt feelings in the wake of decade-old decisions about sewer services out in East Portland. Many residents east of 82nd Ave. don’t feel they were given a fair shake when they were annexed into Portland and our sewer system. It is important that elected officials like me are out in the community being held accountable for the decisions that we make that affect the lives of our residents. I was pleased that people care about storm water management, and could hear that joining the system is better for the whole. 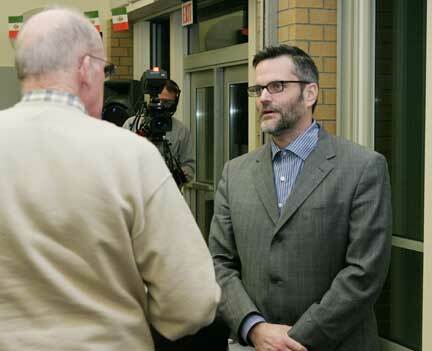 Commissioner Sam Adams talks with a neighbor at his Budget Forum held in Parkrose. Overall, we asked, what specific effect will this meeting have on the budget process? “I feel good about a few things coming out of this meeting. I was glad to see so many residents attend. The strong turnout affirmed for me that these town hall meetings are a good means by which to get the community together.